I3) The Firebase Web SDK also runs on the JS thread, therefore potentially affecting the frame rate causing jank with animations, touch events etc. FCM push is currently only available on Android. I would _really_ like for it to work cross-platform so I can send push messages from one place instead of two. Would love to see the mobile vision API opened up on Expo. This would allow barcode, face, text and more detection. @Evan Bacon: great news! Keep up the great work! @Evan Bacon: Thanks! Any timeline estimate on when it will be added to the client? @Evan Bacon: +1 for ETA on timeline. I don't really want to detach because I'll lose Expo Notifications, but I'm getting so many random app restarts during uploads since the JS thread is getting overloaded. I think adding branch.io can be a option but It becomes a problem because segment is already a paid service, instead of it, we should integrate directly the react-native-firebase. +1. Expo can only lose by not adding RN Firebase support. Right now Firebase is mandatory for a variety of business reasons, as many have pointed out, while Expo is convenient and thereby optional. @Anders: I like (and am adding) Firebase, but it is definitely just a convenient backend, perhaps the most optional of web libraries. For instance, instead of Firebase Analytics use Google Analytics, instead of Storage use S3, instead of Functions use lambda. @Evan Bacon: Funny enough, Google Analytics is being deprecated in favore of Firebase Analytics, as all of Firebase is now under the Google Developer umbrella. Your point still stands, though fwiw I found this thread because I now have to eject Expo to use RNFirebase. Please add something like Firebase remote config so developers can easy config them app on Expo project manager page. I believe team at expo are working on integrating branch.io as a deep linking solution. To offer diversity, maybe it is worth to also consider Firebase dynamic links? I think both services provide same features i.e. survival through app store installs, link generation within apps etc... however branch.io has 0.02$ price per click where as firebase doesn't charge for this (as far as I am aware), so why not have free alternative available? I think only drawback at the moment is that you can't use custom domain with fb's dynamic links at the moment, but free pricing might outweigh this for some people. (And hopefully this will be allowed seeing how they enable this in hosting / email right now, but once can only hope). +1 Any ETA, this integration will be very helpful! +1 for ETA, with understanding that it is just a best guess, and people who later get mad when it is not met should be ignored. +1 for ETA. I've found that firebase.storage() uploads don't work consistently using the new fetch/blob methods (the app randomly restarts during an upload) so RNFB support would be great! @Evan Bacon is there any ETA?? +1 At this moment BarCodeScanner doesn't work well on ios. It can't interpret barcode in any direction. Just try and you will see. Eagerly waiting for progress on this release! We have to eject Expo in order to use rnfirebase and lets just say life is not smooth since then. I'm confused, what does "WebSDK" mean? I see the comment saying "The Web SDK column indicates what modules/functionality from the Web SDK are usable within React Native. ", but isn't the point of the whole library to be compatible with React Native? For most basic apps, expo-analytics is more than enough, I feel like the intricacy of Firebase is suited more for major companies that want to track every tooth and nail. In that case, you probably also have a native app team. I know there was an issue closed that essentially asked for same integration, but I wanted to re-raise this in hopes to have further discussion about "Why not to have this?". Having full suite of native firebase services available brings a lot of value i.e. analytics can react to database changes / user acquisition from dynamic links etc.. easily + integrating with firebase functions using default services is a way better user experience imho. It is all in one place under one price plan, as opposed to using third party services like segment or sentry and paying separately. What if we want push notifications handled via firebase as opposed to going through expo servers as well? I don't really like the modal option of signing-in, it is not a good user experience (imho). So if you could guys incorporate FirebaseUI, that would be great! Gave up. Because they have no plans to integrate it. I completely agree. This is the simplest database, push notification, file storage, ..., solution. Being able to use this library without ejecting would be so so so nice. I have proposed a solution to this problem. You can voted up if it make sense to you. If Firebase explicitly acknowledged react-native and Expo, then with a bit of work from them it could be a much easier integration. For example, for FCN, Firebase could implement an expo config flag to use the expo notification workflow during development or for apps that wish to stay totally in the Expo ecosystem, then to use their own flow when the app is standalone. The same logic goes for AWS SNS etc. 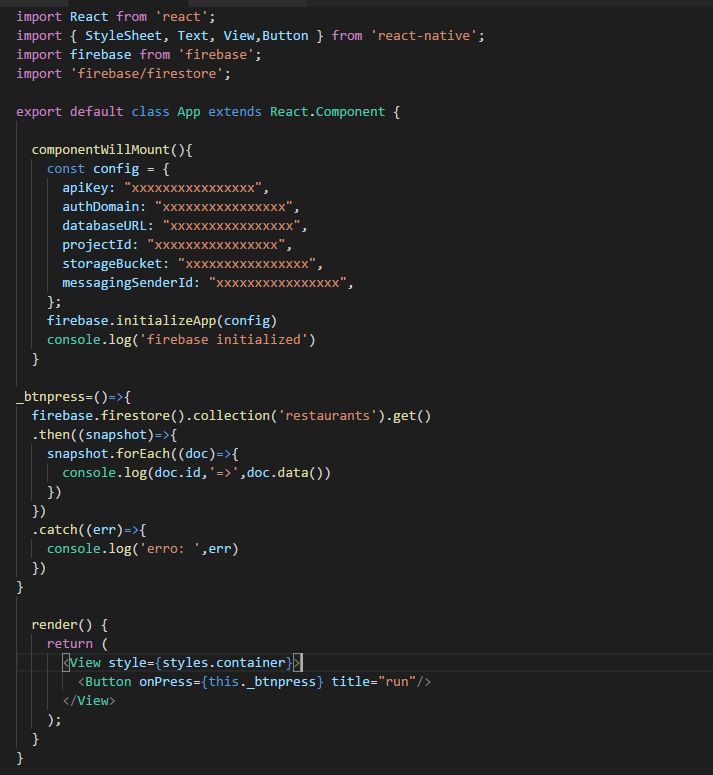 I hope we can integrate this 'react-native-firebase' into Expo. Please. Why would I want to ship my application with extra megabyte of code that I don't use? Firebase is required for small portion of businesses. I think it really is a step ahead. Even though I rarely use firebase, and when I do, it's just some small parts of it as a complement to my api's. But I see a lot of developers doing or something like that, or using it extensively. 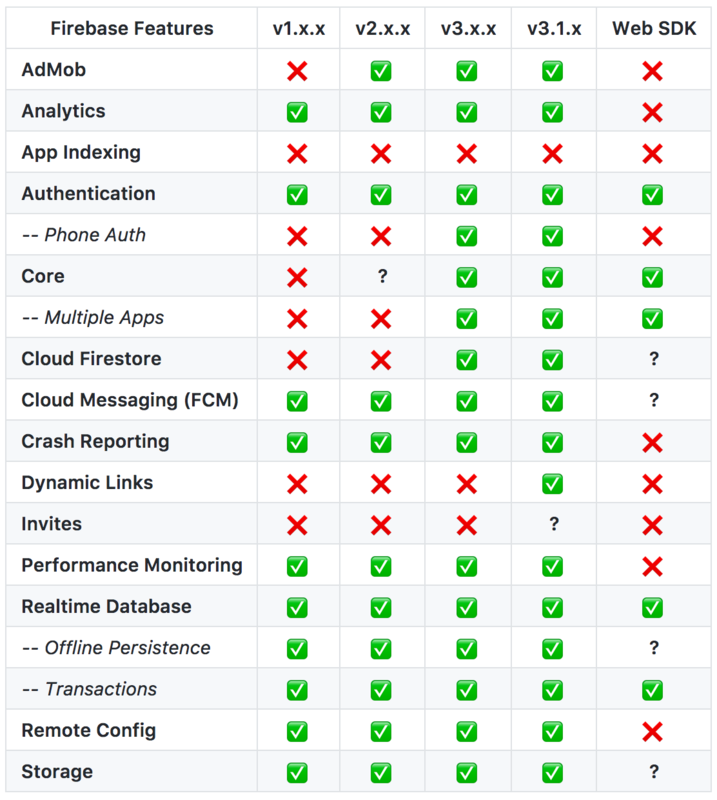 I see that Phone Auth is becoming more popular recently and Firebase gives a very nice free quota (10k/mo), whereas some more "powered" authentication providers don't (Auth0 and AWS Cognito). And playing with this feature on the web sdk doesn't work that well due to its recaptcha implementation. As they don't support an authorization code flow, I wouldn't recommend opening an AuthSession on a page that implements the firebase auth flow and pass back the access token itself to the app (a better approach in this case would be an authorization code flow and even better a PKCE flow). All that explanation is to point out that it has some limitations that work arounds could be dangerous or just not possible, and Firebase is indeed a very popular solution among developers. Even outside the RN world, I see a lot of people doing native development and using it. @Evan Bacon: Well... Offline is supported by the Web SDK in browsers, it doesn´t work in react native though. I'd love this feature, but sounds like the Expo team isn't so keen on it? @Patrick DeVivo: It makes no sense why they are so against it. Firebase almost became a standard backend and the web SDK are not good enough as it does not have offline support and not as fast. I really hope they reconsider. What about adding react-native-firebase in expo sdk? Is it a lot of hassle? cloud firestore with proper documentation and example! @Manfye Goh:firebase firestore has quiet good doc on how to setup the project and use SDK. It is not expo related issue. Any updates on plans for Cloud Firestore compatibility? We'd like to use it without having to eject from expo if possible. Thanks! @Sebastián Lobo: you don't have to eject from expo, to use Cloud Firestore. @ryszard: I can't seem to make it work. Can you provide us with a piece of code? @Fernando Mendes Weffort: what exactly do you want to do? Use real time data base like firebase? Currently i am using both firebase real time db and firestore with expo. @Sam Safaei: I will try right away!! are you using ios for testing?? 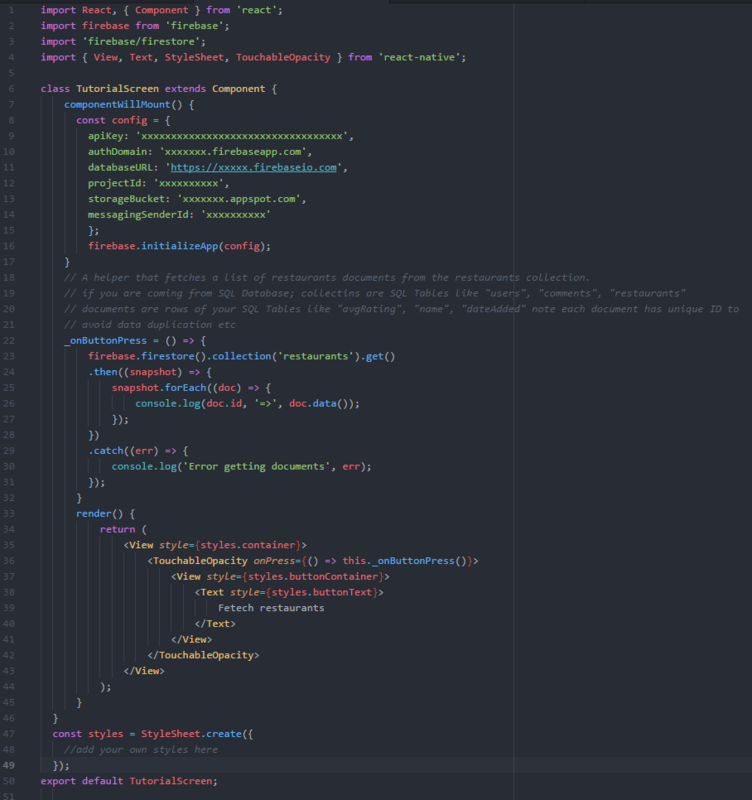 @Sam Safaei: So, this is the code, pretty much the same as yours. When I click the button, I get no output at all... I even added a log to make sure the function is being called and it is. What versions are you using? it may have to do with your firestore security rule. Take the "if else;" for now. but remember this allows anyone to read and write to your database! later you have to learn how to authenticate your users to avoid allowing anyone to read and write from your database. also make sure you have a collection of 'restaurants' with some data. also check your package.json file and if your firebase version is older than "^4.6.0" make sure you update it. @Sam Safaei: I wish this was the reason. @Fernando Mendes Weffort: You are right! I have an old android 4.4.2 that I don't bother testing on because its really slow. I just tested my code on it and It doesn't work. This is probably a SDK issue on Firebase side. I am able to use Firebase-Authentication to authenticate. I think the "firebase/firestore" library has an issue with android platform. Additional firebase feature now needs support from native SDK's. Cloud Firestore (their new database) won't work via web sdk. @ilja: The new Cloud Firestore database looks good , if expo can support this feature will be great. @BCGen: Yes, that's the main point now. Firestore is really a great product. But you lose offline persistence if you go JS over native sdks. @Alessandro Pungitore: There are few implementations like sentury and segment here, given developers have time firebase seems like a good choice as well, as it provides full suite needed for successful mobile app. Hi there! If you need to use the full Firebase SDK, with Firebase Analytics, Firebase (rather than Expo) Push Notifications, Firebase Crash Reporting, and Firebase Links, you will need to eject for the foreseeable future. Let me explain some of the problems with this. I've numbered them so that it's easy for you to reply to specific points. 1. The mobile analytics space could not be more fragmented. It is so fragmented that there is a meta-analytics company that tries to pave over the fragmentation for you -- Segment. Every mobile analytics company wants you to integrate their SDK which has claws in all sorts of corners of your app. The SDKs don't always necessarily play nicely with each other. The exact same goes for crash reporting. 3. Push notifications through Firebase will never work within the Expo client unless Firebase decides that they would like to support pushing to the Expo push servers. Notice that when you get a push token from your user it is an Expo token, rather than a normal device token. This is an abstraction over the device token and your experience id (@yourusername/your-experience), so when you handle the push notification the Expo app knows which experience to open. It's possible to make this work in standalone apps, but then you lose out on the ability to test the app properly in the client. 4. It's possible that we may support the dynamic links SDK -- we are in the process of adding Branch (http://branch.io/) right now for standalone apps only and we could do something similar for Firebase dynamic links. If someone creates a separate feature request about this and explains why it is valuable and gets enough upvotes we can look into it! 5. Firebase Database, Cloud Messaging, Authentication, and Firebase Cloud Functions already work as expected with the JS SDK. Soon, Storage will work as well (still waiting on Blob work we've been doing to get upstreamed) -- although you can use it already if you use Firebase Cloud functions to save to storage. So, integrating the entire SDK is not on our roadmap currently. If you can single out which features you believe are important and make feature requests for each of those, that would be much appreciated! @Brent Vatne: Thank you for the reply, this did help to understand your point of view better. Not having this in expo won't be a deal breaker, as you said there are alternatives + I didn't realise caveats around crash reporting and push notifications. @Brent Vatne: thanks for this response. 1 - got it. 2 - didn't realize that - awesome. 4 - good to know on Branch. 5 - didn't realize these were good to go. Right now I use Facebook and Firebase analytics and even Firebase doesn't play nice with Google Analytics. Will explore Segment more. Thanks again for sharing thoughts. @Brent Vatne: What do you guys think about this request after i/o 17? Being able to auth with phone number seems kinda cool + app performance monitoring (although I'm not sure how this would work within expo client). All in all firebase seems to be going into right direction and now that it is starting to open source it's sdk's, maybe it will be easier to start supporting it in expo? @Brent Vatne: awesome write up. is there a performance hit using the JS database / messaging / auth libraries over the native ones? I believe I saw someone mention that once, I'm not sure if it's bologni or potentially relevant. Does access to the native device push tokens in SDK 18.0.0 change point (3) at all? @Patrick DeVivo: With database, I think you loose offline persistence when using js one for native apps. but there is no message function. @Brent Vatne: I want to take issue with point 5. Firebase authentication using phone number (https://firebase.google.com/docs/auth/web/phone-auth) really doesn't work well, mainly due to how the reCAPTCHA verifier works (it must sit on a web domain). You can make it work, but the end-user experience is absolutely horrendous. Given the rapidly growing popularity of phone number auth (no one I know developing today uses email/password for mobile first apps), I would think addressing this would be worthwhile. We are looking into this. Please let us know what features are most important to you from the native SDK so we can investigate the viability within Expo. @Brent Vatne: Personally speaking, I'd like to use Firestore and Analytics. But wouldn't it make sense to support all the features if you are going to support Firestore for example. You still need to support authentication to work with Firestore, wouldn't you? I really don't mind it, if the SDK has claws all over my app, as long as they provide me with a right information! Also its more convenient for me to have all my subscription or billing in one dashboard than dealing with multiple companies. I have provided a solution to this problem, I really like to know about your feedback. @Brent Vatne: I think a big thing that is missing from this is offline and caching. #5 above is true, but doesn't really work for production apps where you can expect offline and need caching for performance. @Brent Vatne: Will this include Offline Persistence? This would be really helpful for apps using Firebase to store and access data. @Chris Chidgey: don't forget to up vote it so guys have better chance of seeing it. There is alternative to analytics via segment, you can populate firebase with it, but then all that real time functionality is kinda lost.